One of the many pleasures of being a bookseller, is meeting the authors and attending their book launches. I've known about this little gem based on real life events in Albury, NSW for a while now. Loretta lives locally and a year or so ago, she popped into our bookshop to discuss publication options and, eventually, cover design options. Due to the regional nature of her story, Re's manuscript was rejected by several major publishers. In the end, her friend, Juliet, from The Wild Colonial Company, decided to publish it for her. This week we had the Sydney launch of Stand Up and Cheer (the Albury launch was October last year). Juliet & author Sue Woolfe introduced Loretta and her book to a packed house, followed by the usual festivities and book signings. 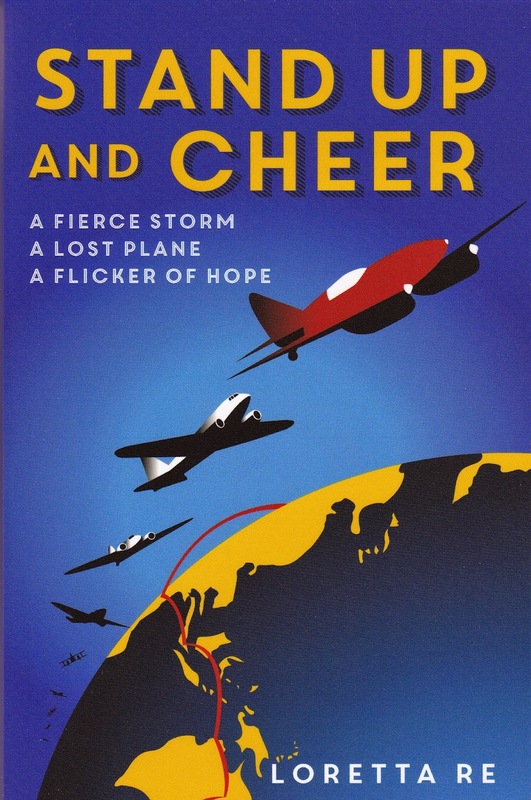 Stand Up and Cheer is dear to my heart because Mr Books grew up in Albury & the story of the Dutch plane, Uiver's sudden landing in Albury in 1934 during the great round the world air race is a well-known town tale. Even though we already knew how the story ended, Re created a lovely piece of tense writing that had me on the edge of my seat! This is a small country town story, but its heart encompasses the whole world. A truly great book, with a message worth saying, will transcend its setting. Stand Up and Cheer does this by emboding the universal themes of courage (physical & moral), friendship & innovation. It's well-written, with oodles of great details that reflect just how much research time Re put into this book. The inside covers include photographs from the time & the end notes reveal the impact the abrupt landing had on the Netherlands as well. A thoroughly enjoyable and absorbing tale for mature 9+ readers & for plane enthusiasts & Biggles lovers of any age the world over! What a surprise! Thanks so much for bringing this to my attention. I don't know anything about this part of Dutch-Australian history. I'm on it like a bonnet! Can't wait to hear what you unearth Nancy!